For too long, the Wyrm has spread its influence across Mother Gaia. In pain, she cries out to her strongest children. With a howl, they answer her. From the white-hot crucibles of battle they arise, joining into packs to tear through all who would threaten their world. But the Wyrm, too, has its dark heroes, and they are willing to do anything to eradicate the Garou forever. The greatest champions of both sides are gathering. Now the Garou must call on allies they wronged long ago and steel themselves against the corupt minions of the Wyrm. They must fight the coming war on all fronts, from the Umbra to the Amazon rainforest. The War of the Apocalypse is here. 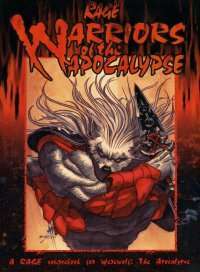 Rage: Warriors of the Apocalypse is the RAGE sourcebook for Werewolf: The Apocalypse. Werewolf statistics for practically all the Garou in the RAGE CCG, including their backgrounds and personalities. Information on the Wyrmspawn as wll, from fomori and Banes to the hated Black Spiral Dancers. A Gathering of never-before seen statistics for famous Werewolf characters, including Mari Cabrah and Lord Albrecht.